Posted: Wed Aug 16, 2017 12:06 pm Post subject: [FFG] WEG SW:The RPG 30th Anniversary Edition! 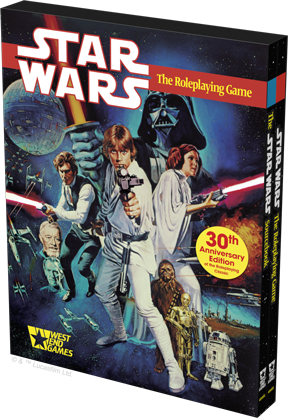 Fantasy Flight Games is proud to announce the upcoming release of the Star Wars™: The Roleplaying Game 30th Anniversary Edition! FFG is rereleasing the original two WEG Star Wars RPG books as a set in slipcase. Aside from a new forward they are supposed to be faithful reproductions of the original books, except that it will be on higher quality paper than the originals. It retails for $59.99 and is scheduled to be released in the fourth quarter of 2017. FFG states they have no intention of publishing any more WEG books. I have my original copies of these books that I purchased in October 1987 (last year being reunited with the sourcebook after over 20 years apart). I think it's awesome that WEG SW D6 is getting published again, even if only as a collectible reprint. I think I will have to buy this and then somehow permanently seal my originals for all time. And you never know. If this sells well maybe that could lead to SW D6 officially coming back someday. A boy can dream! This is awesome! I don’t need new books, but, I love that this is happening. Funny, I was just the other day googling to see if this would happen, on an idle hunch. Posted: Wed Aug 16, 2017 1:11 pm Post subject: [FFG] WEG SW:The RPG 30th Anniversary Edition! It was announced today, so good farseeing roll. The Force is with you. I have all the entire WEG Star Wars line. But, I still think this is awesome. So... FFG is doing a 30th anniversary reprint of the 1e core book that shares a lovely slipcover with a reprint of the 1e Star Wars Sourcebook, both on higher quality paper. I am rather excited. Came here to report the same thing.. pretty exciting. Many of us are excited! There have been 6 threads started here about it so far today. Unfortunately we can't merge threads at this site. Perhaps we can show FFG that their is still a demand for this game. I say spread the word. It looks interesting. I'm actually really amazed that they were able to secure permission to do a reprint, but with the property holder being so far reduced, I'm sure a small infusion of cash would do the trick. FFG has the Star Wars RPG license and D6 is open, so yeah, it would only take a little payday to current WEG trademark owners to make this happen. Okay, on one hand its just a collectors edition for people with more money that I have. On the other, I'm like, kinda irrationally angry that they are doing this. I mean, rules changes aside, there hasn't been anything really new in RPG since WEG went under, baring stuff from prequels or other things that weren't out when WEG had the license. Look through with wizards of the coast stuff or FFG and like 90 percent of the stuff (ships, equipment, etc) its from WEG if it wasn't from the prequels. Even Rebels steals stuff from WEG. And none of them acknowledge it. And now they're doing a reprint of a game that wasn't theirs. I suppose I shouldn't take this personally, but I'm just kinda fed up with it all. Well you do at least acknowledge that your anger is irrational so give yourself a little credit for that. The good news here is that it will say WEG on it so WEG is getting acknowledgement for this. I think it is flat out fantastic. First Edition, straight core rulebook, is my favorite set of D6 SW rules. And, D6 is the only way to go when it comes to Star Wars. No other system (has yet) compares. WEG Star Wars 1e was the start of it all. And I have played D20 SW and FFG SW - D6 is definitely the only way to go for SW! FFG owns the roleplaying IP material but not mechanics, those are owned by WEG still and is OGL. So this publication would have to be released as OGL. If so, I think legally this opens the door for additional SWD6 OGL content which can be released on such things as DriveThru RPG and actually get paid for. I am not a legal eagle, but I will try asking a buddy of mine who is in the law about this. Didn't WEG sell D6 to some other company last year? I thought I heard something about that. Assuming ShootingWompRats is right about them using an OGL version of the rules, it wouldn't really matter. The OGL, and material released under it, remains the OGL. One of the aspects of the license is that anything released under it stays released that way (sort of how you can't subsequently claim copyright on something in the public domain). That wouldn't put Star Wars itself out there... it could still be called "brand identity" stuff and roped off from the OGL sections; WotC has done this with Mind Flayers and Beholders, for example... but other companies have made their own versions without using those words or images. To be briefly paranoid, could this bring unwanted legal attention to this site? Now, no one really has much to lose for us sitting around talking about a 30 year old game. If this comes out and does well... we're a combination of "the best place to talk" and "distraction from FFG's efforts." There are, like, six people who actively use this site. Unless it becomes a "principles" thing, I dont see it being an issue. I think technically Star Wars: The Roleplaying Game and The D6 System Roleplaying Game are completely different entities. Despite that for obvious reasons in gamer parlance we may say we play Star Wars d6, the former is owned lock stock and barrel by Lucasfilm. Didn't I post this yesterday in the Rancor Pit section? It looks like my post got nuked. Guys, about the who owns this stuff, I checked a copy of the 1st ed I have. It says copyright 1987 Lucasfilm Ltd. Now, I'm not legal, but I asked an author I'm close to and from what we can tell from that one page, that means that Lucasfilm owns the book. That's all the pictures, all the words, the system, lock, stock, and barrel. They are giving permission to FFG to print it for them. Oh, now I see Falconer's post, yeah, basically that. Open d6 is different enough from Star Wars that they are two separate entities. But yeah, I checked a few WEG titles, and a few WotC titles, they are all copyright Lucasfilm. So that means that if Lucasfilm and its Disney masters decided to, they could have FFG, or anyone else for that matter (baring contracts and such), reprint any and every book from the Star Wars RPGs no matter who wrote them. And from a basic perspective they will keep that right until something like 95 years after the first publication. There was a lawsuit between WEG and Lucasfilm about who owns the system. WEG used it for Ghostbusters in 1986, so they own the D6 system which is currently operating on an open license. The books belong to Lucasfilm. So yeah, if Disney wants to publish the D6 RPG again, they are good to go.